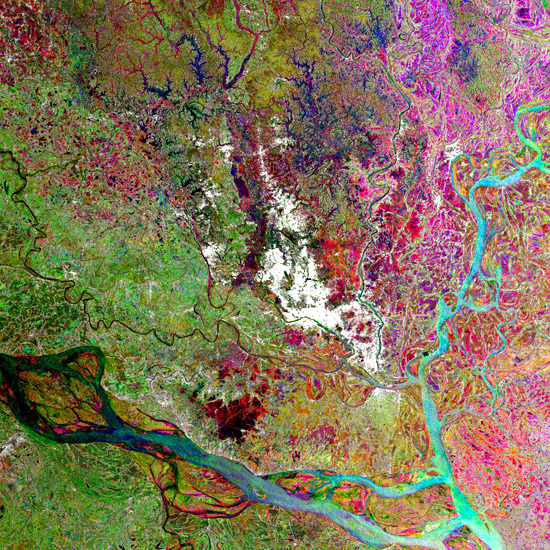 From the European Space Agency comes this “multitemporal” satellite image of Dhaka, Bangladesh at the confluence of the Ganges and Brahmaputra Rivers. Prismatic, incandescent, and curiously, palpably supple. Tissue-like. Soon after discovering the image (and also this image), the BBC reported on the factory riots in Dhaka earlier this month, one of the many civil, political and religious unrest in the country this year and last. So if anything, this synchronicity highlights the often jarring contrast between the somber, lived experience on the ground and the hypnotic beauty of satellite imagery: the paradox of Icarus.